The story of The Rake’s Progress, derived from a series of eight early 18th-century engravings by Hogarth, transformed over 200 years later to text by English and American librettists, with music by a Russian composer, has a certain timelessness to it, and despite textual references to London, a certain place-lessness also. One can imagine a great variety of times and places in which a lazy but essentially innocent young country lad, not the brightest penny in the purse, comes into a great deal of money, moves to ‘the big city’, chooses his companions unwisely, becomes thoroughly corrupted and ends up dead in a ditch (or in this case, saved from death’s clutches but mad in an asylum). 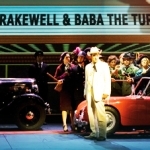 This revival of 2008’s Robert LePage production sets the opera firmly in mid 20th-century America, in line with the opera’s creation rather than that of the source material, and – the few references about ‘going to London’ or ‘gone to America’ aside – it works very well. Highly stylish without being over-stylised, effective visual features include a cinematic ‘wide-screen’ as backdrop for the Truloves’ estate, all flat horizon and rolling clouds (which darken when Nick Shadow is around); Tom, as he is seduced by Mother Goose, being literally swallowed up by, to put it delicately, the lips of a big hole; a derelict neon-flickering Vegas card hall for the graveyard scene; and a particular favourite, the simple elegance of Anne in her little red car, driving through the night to go and find Tom (accompanied by a minute or so of ravishing trumpet solo). On the subject of wind solos, unfortunately The Royal Opera simply publishes in the programme a list of all their orchestral employees, rather than of those who are playing in the particular performance one is hearing, so I am unable to name names. However, in an orchestral performance which was strong across the board, the principal trumpet, bassoon and flute stood out as superb in their solo passages. Although Mozartian forms are perhaps the first to spring to mind (particularly when combined with ‘set-piece’ structures and the same orchestral forces as Così fan tutte), the score of Rake draws on a huge variety of musical influences from both previous centuries and Stravinsky’s present day; however, the detailed interlocking rhythms are very much his own, and like a great deal of his music, require energy coupled with absolute precision to pull it off, something which was achieved admirably by Ingo Metzmacher. The strings were crisp, the brass and percussion tight, but to a woodwind-geek such as myself, it is Stravinsky’s genius for blending and highlighting the range of reed and flute timbres, that made some of the sound textures emitted delicious enough sometimes to draw the attention from singers to pit. That I spent a considerable amount of time focused on instrumental musicians should not be taken as any kind of slight to the singers on stage, who formed a very strong cast. Anne Trulove can sometimes be annoying, the kind of drippy girl you can quite imagine Tom Rakewell deserting, but Rosemary Joshua made her genuinely affecting, having in both her singing and acting an air of purity without insipidity. The vibrancy of her recitative “How strange” and aria “O heart be stronger” was one of the highlights of the performance, and her final lullaby to the delusional Tom (accompanied by the two flute lines, I floating above and II pulsing below) delicate and affecting. The other female character, Baba the Turk, can also be prone to one-dimensionality – an amusing fairground sideshow, in fact – but Patricia Bardon, rich-toned in voice and admirably dignified, made her a real woman who happened to have a hormonal imbalance causing abnormal patterns of hair growth, in a time when the possession of such an unusual physical feature was a short-cut to celebrity status. The dynamic between the duo of Tom and Nick is of great importance to the success of the opera, more so than between Tom and Anne. I still have imprinted on my memory the 2001 ENO production, which paired tenor Barry Banks with bass-baritone Gidon Saks, which made very effective use of the size disparity between the two men, with Saks looming malevolently behind the (visually) diminutive Banks, giving the clear impression of master and puppet. Here, Toby Spence (Tom) and Kyle Ketelsen (Nick) are of a very similar height, build and age (or at least, it appeared so from the audience), and this by itself created a different, but equally valid kind of relationship – although there was a modernisation of the puppet-master theme, in that during the brothel scene Nick was portrayed as film director, raised above the scene with megaphone to bark orders to Tom and the ‘extras’, and video camera to film the musical and pornographic goings-on. At the start, Nick was dirty, pale and ill-looking (perhaps from living down an oil well, as he appeared to be doing) with Tom bounding around and tanned to an orange tint, but throughout Act 1 Nick became steadily healthier (and smarter-attired) as Tom degenerated to a pathetic (and badly made-up) wreck snorting coke behind his trailer, as if the one were sucking the life from the other. This was very cleverly portrayed by the two men, along with the increasing dependence they each have on the other over the course of their year. Considered individually, I am undecided about Spence’s Tom Rakewell. A fair amount of the time his voice was pleasant to the ear, such as in the touching cavatina “Love, too frequently betrayed”, but at other times it seemed thin and a little colourless, with lack of shape and balance to the longer vocal lines. In the first scene, the hamminess of his acting would have better fitted a West End musical – particularly the throwing around of his hat to express emotion – although, having said that, his constant playing around with said hat did lend a certain poignancy to the moment when he was sucked into Mother Goose’s cavernous ‘bed’, with Hat of Innocence left sadly behind on the floor. However, I expect the over-acting was an intentional artistic choice, and indeed, Spence threw himself into the role with enough conviction to overcome any vocal inconsistencies. Ketelsen was, as ever, a joy to hear from the moment he first opened his mouth, with smooth chocolate tones ringing out effortlessly. His take on the Nick Shadow character was less blatantly sinister than many, elegant in manner and only ramping up the full demonic element at the end, with a huge “I burn, I freeze!” (dramatically somewhat undercut by the rather panto-style descent into hell-fire). Of the other roles, Jeremy White’s dark bass was a pleasant surprise in his too-brief stint as Anne’s amusingly disapproving father. Graham Clark rather grated on the ears, although his Auctioneer and Frances McCafferty’s Mother Goose were there principally to provide amusing and grotesque characters, which indeed they did. The chorus were at times perhaps a little ragged in their entries, but in fact this was more in keeping with their portrayal of brawling drunks and prostitutes than perfect synchronisation would have been. Their final contribution, as Bedlam inmates in “Mourn for Adonis” was slow, solemn and a peaceful winding-down to the whole unfortunate tale.